All Is Well ... Really? Even if your state allows rabies medical exemptions you could be facing most of the same issues as those who don't have that provision written into their laws. Protecting medically exempt pets is a huge responsibility. In some counties if a pet is involved in a bite or scratch incident it will be treated the same as a vaccinated pet (unless there is reason to believe it had contact with an animal that might be rabid.) In other counties the regulations are ridiculous but at least they can't legally confiscate our pets and kill them just because they aren't currently vaccinated like they do in some states that don't allow medical exemptions. Rabies is the big concern. As you can tell from the statistics provided by the CDC and the Humane Society there are confirmed cases involving dogs and cats but those numbers are actually quite low and especially when you the compare the number of dogs and cats "owned" in the U.S. with those rabies statistics. I am not aware of any statistics showing how many of those pets were medically exempt. My guess is none. It would be interesting to know how many of those rabid dogs and cats were "owned" how many were feral and how many were due to vaccine failure. Your pet does not have to do anything wrong, it only needs to be accused of it. You might think you have no worries if you have a fenced yard. You can protect your dog by keeping it away from visitors. When guests come to visit just put the dog in the back yard. That's not really such a great plan. If you look at the picture on the left you might immediately see the issue. 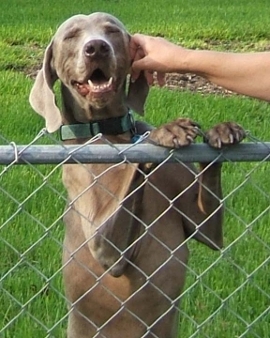 The dog has his paws on the fence and the hand that is petting him is right there by his mouth and his claws. It's a great opportunity for an accidental bite or scratch incident and especially so with an excited dog. That's not the only problem. Is that fence going to keep wildlife out of your yard and away from your medically exempt pet? If a medically exempt pet is outside it should be closely supervised at all times. "Any animal bitten or scratched by either a wild, carnivorous mammal or a bat that is not available for testing should be regarded as having been exposed to rabies. Unvaccinated dogs, cats, and ferrets exposed to a rabid animal should be euthanized immediately. If the owner is unwilling to have this done, the animal should be placed in strict isolation for 6 months and vaccinated 1 month before being released." That "strict isolation for six months" probably will not be carried out at your home. I'd really hate to see the price tag on that and don't forget about all of those vet bills for your sick pet. If an animal comes into your yard while your medically exempt pet is outside what would your pet do if you weren't there to prevent them from coming into contact with that animal? Constant supervision is a vital part of keeping your pet safe. Hopefully your pet has been taught to come to you when called and responds well in any situation. The need for medical exemptions is often temporary but in some cases it can be for the life of the pet. Sometimes extra training is an excellent idea. Some pets are not easy to train while others are like happy little Einsteins who just want to please us. The behavior seen in this in this video was taught using the "stay" command. Mikey knew the deal and he quickly reached the point where we didn't have to tell him, he knew what was expected of him and he did it. Having a fenced yard is great but don't let it become a false sense of security. Pets can climb fences, jump fences, flip gate latches, dig out, or be stolen. We have to be extremely protective of our special needs pets. It is also always a good idea to watch out for poisonous snakes and spiders. This is especially true when your pet is already struggling with an assault on the immune system. When dealing with some sick pets their diet is often an extremely serious issue, eating just a small amount of some foods can make them very ill. When the vet asks, "Have you been able to get him to eat anything today?" You never want to be forced to say, "Yes, he snagged an entire pack of chocolate chip cookies off of the dining room table this morning while I was making his nutritious breakfast." Counter surfing can really be a problem, especially with big dogs because they can reach so much but they can be taught to restrain themselves. You may not realize it yet but when you have a medically exempt pet your world changes. You might want to check out "Responsibilities" if you haven't already.